This first stage of the five-stage hike across Western Slovakia between Hrad Devín (Devín Castle) and Bradlo is an easy initiation into the walk. We’ve allowed more time for this because of the points of interest en route and because the part of the walk that negotiates Bratislava is a little complicated (hence the reason for the loooong write-up, which is deceptive as the stage itself isn’t so long!). For stages two and up, we are most fortunate to have had them given a thoroughly up-to-date hike by fellow Small Carpathians enthusiast Jonno Tranter – so see his articles on walking the trail from Kamzík right through Western Slovakia to Bradlo – and beyond on the Cesta Hrdinov SNP (which eventually leads to Dukla Pass in Eastern Slovakia) as far as Trenčin. Of course, for those worried about whether Štefánik actually spent much time traipsing through Bratislava’s western suburbs, and that they will be missing out on an essential cultural chunk of the man and his life by not walking this part, the answer is almost certainly NO. In fact, it’s advised to start walking on stage two of the walk, at Kamzík, if you don’t dig walking through cities OR get public transport between the end of the Devínska Kobyla part of the walk and Kamzík (we’ll advise you how to do this at the appropriate point). 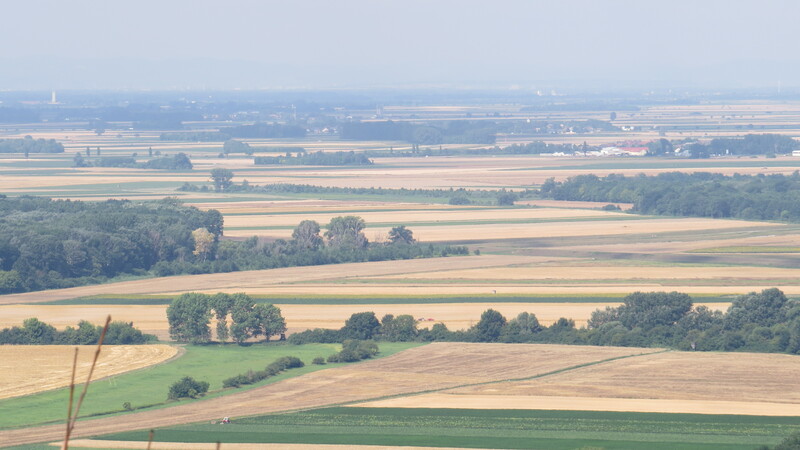 There is the added caveat that if (as is likely) you set out from Bratislava to Devín to begin this hike, you will necessarily end up walking back through Bratislava halfway through this stage – time you could otherwise have spent getting out into the really cool woods. STILL a hiking trail is a hiking trail and, city section notwithstanding, there are some great things to see on this stage of the trail, and I have also always been a big fan of how cities and their surrounding countryside merge and mingle, which this stage also exemplifies rather poignantly. Devin Castle, accessed by Bus 28 from Most SNP at least hourly, is your starting point for the hike. The castle, dating from the 9th century, is a spectacular ruin, and is undoubtedly point of interest number one – along with its surrounds which include the confluence of Morava and Danube rivers and, above, the massif of Devínska Kobyla, the furthest extent of the Small Carpathians. There are other sites that detail more information on the castle, but we have prepared this general (and, we like to think, fairly detailed) post on the castle and Devínska Kobyla right here). From the castle, the Štefánikova Magistrála takes you through Devín and up out onto Devínska Kobyla, brings you down into Bratislava, then up out of the modern part of the city up to Slavin monument and through one of the most pleasant city parks en route to Kamzík. Bus 28 drops you, at the end of the route, in the castle forecourt. From here my first thought was to walk across in front of the hotel here to touch the castle walls. I doubt Štefánik ever did this but when hiking a peculiar sense of thoroughness kicks in for me that actually gets me into all kinds of scrapes. Anyway, I touched the castle walls, so there. Then turning round and keeping the hotel on your right (and following the edge of the property along to its end) you reach a couple of noticeboards, a sign pointing to Cafe Eden, and a little lane leading to the right, ascending slightly past a restaurant on the left (the beginning of the hike). This lane ushers you up passing some houses to skirt what becomes the edge of the castle grounds – after a short while it turns sharp left. 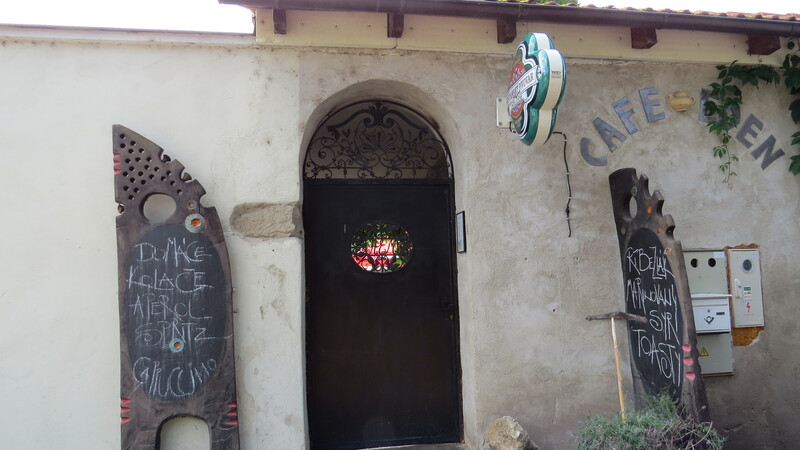 You now head straight on another lane taking you passed the delightful Cafe Eden – one of the Bratislava area’s top cafes and certainly worthy of its own separate forthcoming post on this very site. Afterwards, bear immediately right on Hutnicka and then left on Rytierska to reach Devín’s church after a small pedestrianised section. At the corner of the church grounds is the first actual Štefánikova Magistrála sign: reading “Uzky Les (narrow wood! )” 35 minutes and “Slavin (as in the monument in central Bratislava) 3 hours 55 minutes.” Here you want to go straight over the main road and up to the left of the church on a narrow lane. The houses soon give up the ghost, and at a rather-too-subtle red trail sign on a tree an even narrower lane along the bottom of a tree-lined gully climbs steeply left. Take it: soon the views begin to open out. This lane turns into a track just after one rather idyllic secluded house, and vistas of Devín with the pancake-flat fields of Austria become visible. Now on a path through thick foliage, you climb onto Devínska Kobyla, the afore-mentioned last (or first, if you’re coming from this direction) bastion of the Small Carpathian hills that it’s no secret I have an affection for. It’s a massif worth spending some time in (diversion number two on today’s stage) because of the phenomenon of Sandberg, a spectacular sandy outcrop left over from the time when all this part of Slovakia was submerged by the sea, and because of the views along the Morava river and Austrian border, near where many Cold War-era bunkers and military paraphernalia remain. Your path kinks to the right of an escarpment area (lush views again, but don’t be tempted to head left down into the escarpment) continuing gently up alongside a few open clearings before dipping into the woods again to arrive at Uzky Les. Here you have a choice. A yellow trail continues (fairly levelly) 30 minutes from here to arrive at Dúbravská Hlavica, the next significant point on the trail. The official red-marked Štefánikova Magistrála winds up into the woods and back to the same point, but in one hour 30 minutes. Englishmaninslovakia took the shortcut, but following red 40 minutes and then green for an hour brings you to Sandberg, at the other end of Devínska Kobyla. All in all, this full diversion adds on an extra three hours to you arriving at Dúbravská Hlavica and makes today’s walk 7.5 hours rather than 4.5 – but it’s worth doing if it’s your first time in these parts, and here (again) is our post with a few pictures on what you can see along this stretch. At Dúbravská Hlavica (accessed on yellow from Uzky Les by continuing on the gorgeous yellow trail up through woods and then bearing right on a much-larger track) you are still in Devínska Kobyla. You are, once you come through a red-and-white forestry gate, on a metalled road, too. Keep straight on, passing a turning to an old hotel on the left, following the road over the top of a small hill passed a TV mast and a house. A little down from here, on the right, look for an information board demarcating a yellow cycle trail. You can’t see the red way marks from the road, but enter into the woods to stand alongside the information board and sure enough, there is your red trail, zigzagging off through a dark but nevertheless fetching stretch of wood. At a bunch of Slovakia’s speciality – weekend mountain houses, some of which look fairly bizarre here – the woodland path once more turns into a track, metalled in places, which you turn right on and continue along with the weird weekend mountain houses on the right. The weirdness is accentuated by the fact that now, accompanying the red way marks, are red eight-point stars, like the symbol of some cult, emblazoned on the trees. After a while this main road-track bends right and the Štefánikova Magistrála (marked red and blue at this point) carries on straight, at what will be around the one- to 1.5-hour mark on today’s stage, or the four to 4.5-hour mark if you’ve taken the extended Sandberg diversion). The path descends to a minor road, crossing straight over into a residential district down on another path to the rude awakening of a junction with a major road. Look ahead of you and you’ll see red signs on lamp posts which guide you forward to a bridge over the major Karlova Ves-Dúbravka road, with tram tracks. Pay attention – because if you don’t like city walking, then TAKE PUBLIC TRANSPORT AT THIS POINT TO REACH KAMZÍK (Take Tram 5 towards Rača; get off at Martinus bookshop; cross to Hodžovo Námestie and take trolleybus 203 to the end of the line, from where it’s a 25-minute walk up to Kamzík. Once you cross the bridge above the tram stop of Karlova Ves, the way marking of the Štefánikova Magistrála dies a death for a while, so this guide may be your only salvation. Turn left across the bridge at the crossroads and follow Pupavova street around to the left. This curves clockwise until you are level, on the other side of the houses, with the bridge you’ve just crossed. On the lefthand side, at the first break in the block of flats you see head down left on a small path that almost immediately bears left again and cuts diagonally down between houses before opening into a park. The path becomes a flight of concrete steps and does, in fact, sport a couple of red way marks. Follow the concrete path until it emerges down at the bottom of the dip on a road. The official path climbs almost immediately up passed houses into the woods you can see ahead of you, but remains frustratingly elusive. Englishmaninslovakia’s solution was to turn right on the road, passing a red-and-white park gate into the valley-bottom park (picnicking, barbecue and play areas for a few metres either side of a wide metalled road) which is part of Mlynská Dolina (valley of the mill). Trees rise steeply up on both sides at this point. Just before the high-rise buildings of Karlova Ves come into view again, a distinct track on the left cuts up through the trees, just after one of several play areas. Take it – at which point you are around the two-hour mark, or the five-hour mark with the Sandberg diversion. It’s a fairly short stretch of wood that you climb through. At the top, bear to the right of the hues you see ahead to emerge on a driveway that you follow to the right, and to the only unpleasant kilometre of the walk. The driveway becomes a proper road; follow and take the first right downhill on the only through-route for cars to meet, at a warehouse, the winding and rather dull road of Staré Grunty (it sounds as bad as it looks). Frustratingly, whilst there are two parks within virtual touching distance, for the moment this road should be followed left in a wide loop via housing developments, on first the 39 bus route (one or two red way marks appear) and then, hanging left around the edge of a shopping centre, the 139 bus route. Now things are more straightforward and you follow this busy road straight to a bridge over the out-of-town motorway to the Czech Republic. Over the bridge, and the route immediately becomes much more enjoyable. The road narrows into a lane, rising between houses on the left and old woodland on the right (nb: little terraced restaurant here which although nothing special might come as a welcome break). After the houses, about 750 metres up, there is a split in the lane. A tiny lane (but one nevertheless passable by cars, sheers up steeply (at least 1:4 or more) passed some houses clearly designed by the city’s fancied architects to join a larger road. Turn right. This is Drotárska Cesta, and you follow this road round left and down to join the main road of Budkova. Another example of how the trail does something a bit strange here: rather than cutting into the lovely Horský Park the quickest way, which would be left, the route takes you diagonally across Budkova and then turns left after the bus stop on Stará vinárska, before bearing sharp left back on itself up the pleasant lane of Francúzských partizánov to reach the park this way. This is probably because, at the junction of Stará vinárska and Francúzských partizánov, you have the option of continuing straight on to check out the very impressive Bratislava viewpoint of Slavín (it’s significant worthwhile diversion number three). Missing the nature by this point? As you arrive at the three-hour/six-hour mark of today’s stage by Horský Park – one of the nicest Bratislava parks – countryside-lovers will be pleased to know that a further 30 minutes of hiking from here gets them into nature – unadulterated nature – that doesn’t let up for the next 100-odd kilometres of this path. The city part of this route – whilst it may to some seem unworthwhile – for me provided that beautiful sense of contrast which some long-distance paths have: busy Bratislava district, with people going about their daily business which has nothing to do with hiking, one minute, the next endless woods. 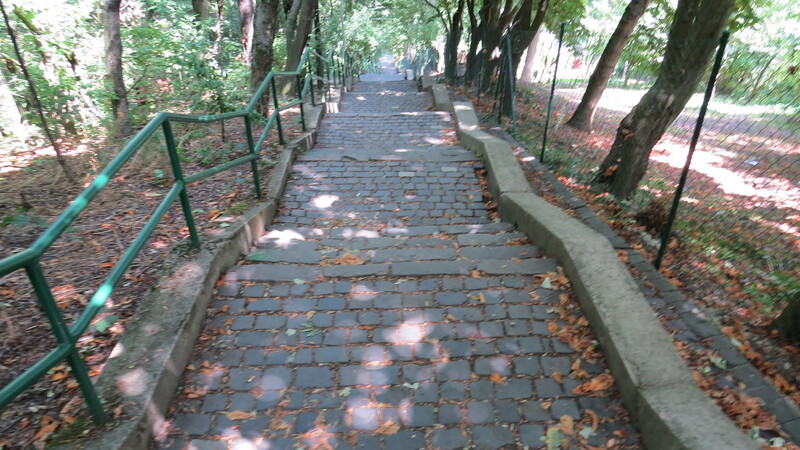 When you hit the woods on the edge of Horský Park, bear right at the information board and follow the stone steps right down through the park to the cafe of Libresso Horáren; yay – a refreshment stop again, and quite a nice one) at the bottom. Turn left on the leafy path along the bottom of the park, which after ten minutes of walking or so comes to the park entrance. Cross straight over onto Bohúňova, continue several blocks to Jaseňová, head up to the end where the road bends left into Brnianska, and emerge to cross over the busy main road directly under a railway bridge on a small concrete path. On the other side of the bridge the path leads left passing garages up to Limbová. Turn left on this fairly busy road, following it down under a bridge to – phew – then bear right after a bus stop up steps on a small path into – ahem – those endless woods we just mentioned. An ambience delightfully reminiscent of old English woodland kicks in quite quickly. Ducking under (duck quite low) the old railway bridge, the path leads left, initially near a railway track and then right at a junction, then almost immediately left, already rising on the contours of the ascent to Kamzík. Quite soon there is another three-way junction of tracks and this time you want the right-most (uppermost) of the three. 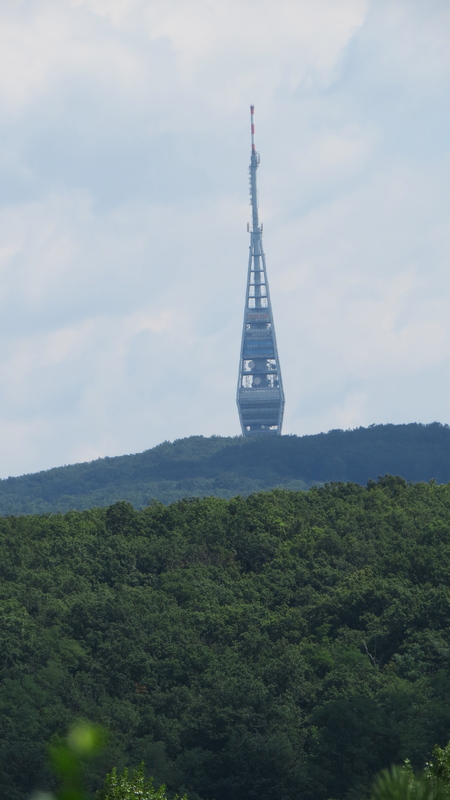 This will take you up through woodland, across a clearing, and right up to the very door of the Kamzík TV mast itself. Kamzík is, as we have mentioned a few times on this site, more than just a landmark: it’s undoubtedly diversion number four on this stretch, and you’ll have time, because this is virtually the end of today’s stage. Check our Kamzík article for more, but first let us guide you to your accommodation for the end of the day which yes, is right up amidst these lovely woods. It’s fairly simple, this last bit. Go down the steps at the entrance of the TV tower. Turn left on the little approach road. After the road curves round sharp right by a parking area you’ll see a minor path cutting down through the woods. Take it and in about three minutes you emerge on the approach road to Hotel West – your accommodation tonight. (it was formerly a Best Western but hey, we’re doing our best here to find you accommodation EN ROUTE – and this is a pretty nice former Best Western, as they go…) And as the post on Kamzík details, there’s a fair few things to do around here.